The Lyon Biennal of Contemporary Art (Sept. 20 – Jan. 7) hosts the best of modern artworks in the world. Here are some installations you wouldn’t want to miss. 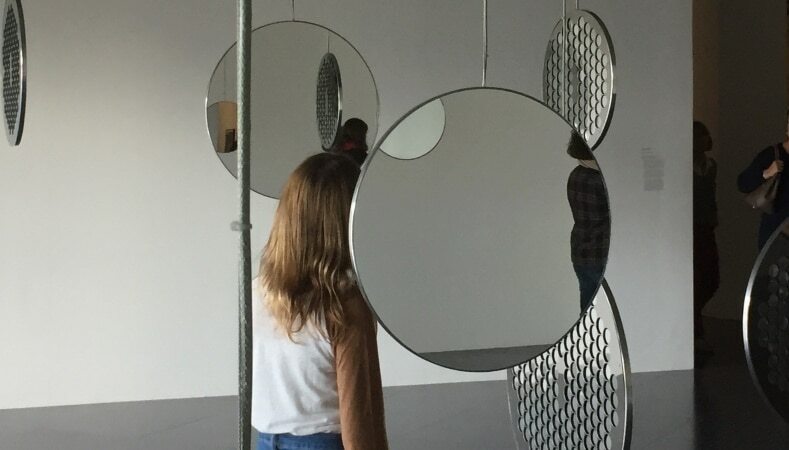 The famous festival of contemporary art in Lyon is ruled by the youth curator Emma Lavigne who worked a lot on the connections between music, dance and contemporary art. That’s why many of the art installations picked for this Biennal named “Floating worlds” really stimulate our senses. We have selected five artworks you must see in the city this fall! The piece of Cerith Wyn Evans, famous artist from London, is a good example of the combination between music and modern art. His large mobile sculpture will be composed of sixteen highly polished and circular panels hung in the air – which reminds us the work of Alexander Calder – broadcasting a multi-channel soundtrack composed by Throbbing Gristle. The visitor doesn’t hear the same thing as he or she walks around the panels and feels quite unsettled. It’s very moving… You can see A=P=P=A=R=I=T=I=O=N at the Museum of Contemporary Art from September 20th to January 7th. 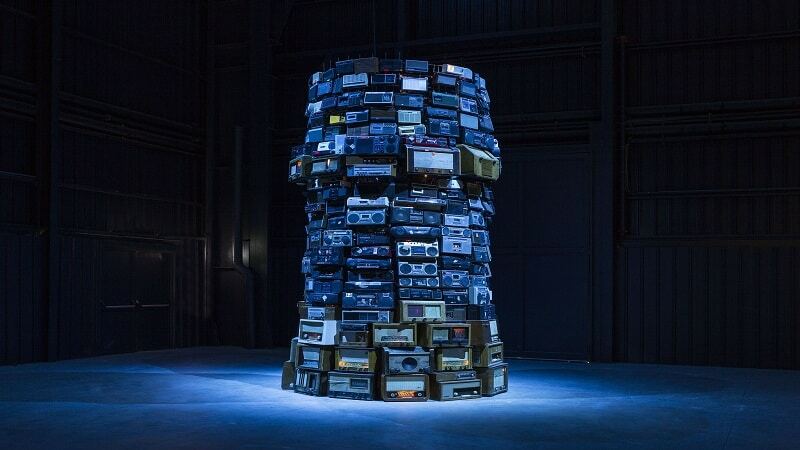 Babel, from the Brazilian conceptual artist Cildo Meireless, is a tower made of 800 radios of varying ages. The large valve radios from the 20’s make up the bottom of the tower while the top consists of smaller mass-produced electronic ones : it seems to emphasise the height of the installation. Each radio is tuned to a different channel and set at the minimum volume to produce a very sensual whispering coming towards the visitors. This piece is also located at the Museum of Contemporary Art. With Sonic Fountain, the American artist Doug Aitken carry the visitors into a very quiet place… Something between an empty swimming pool and a natural cave. 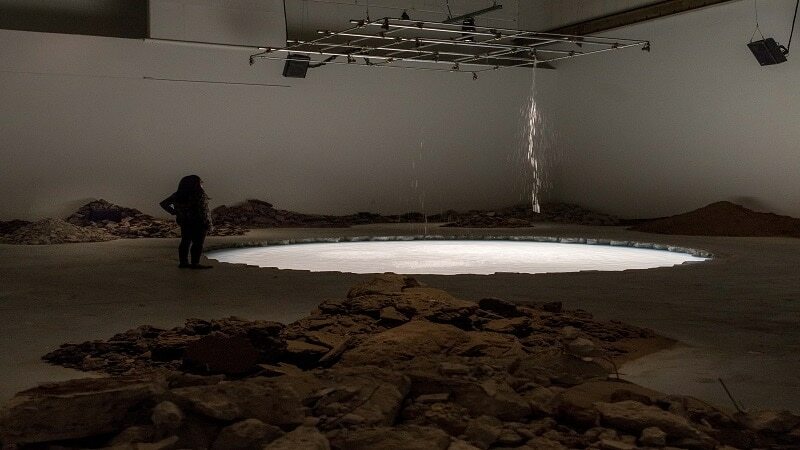 This artwork is a concrete crater in which water drips from five rods suspended from the ceiling. The flow of water – that appears milky white – is manipulated to create specific sounds and regular patterns, close to the breathing rythm. This installation is set at La Sucrière from September 20th to January 7th. 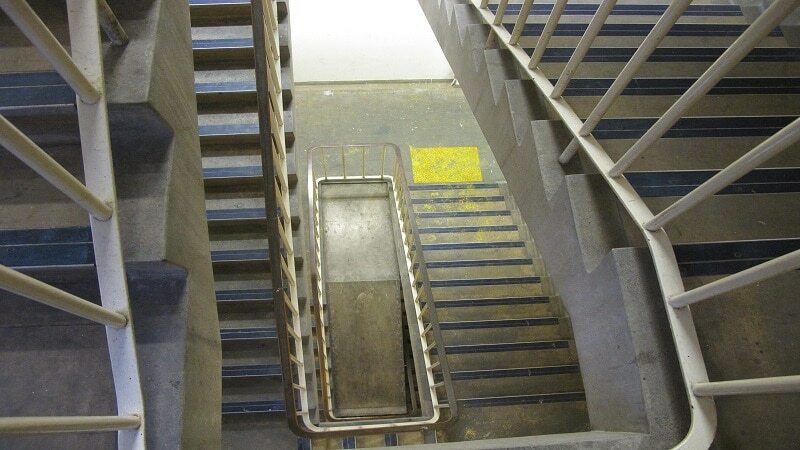 La Sucrière also welcomes the works of Elizabeth S. Clark, a 34 year-old British artist living between London and Paris. Her installations and performances have much to do with the move, the passing of time and the disappearance. Also, she often uses light effects in a very subtle way. One artwork particularly caught our attention : it’s a curtain of golden-colored flakes falling onto the visitors’ shoulders, so that they’ll all leave the exhibition with a tiny peace of art with them. Radome is certainly the piece you won’t miss during this Biennal of Contemporary Art. Set up on the Antonin Poncet square, right next to Bellecour, this dome made of glass and wood is supposed to make us think about new ways to build the city. 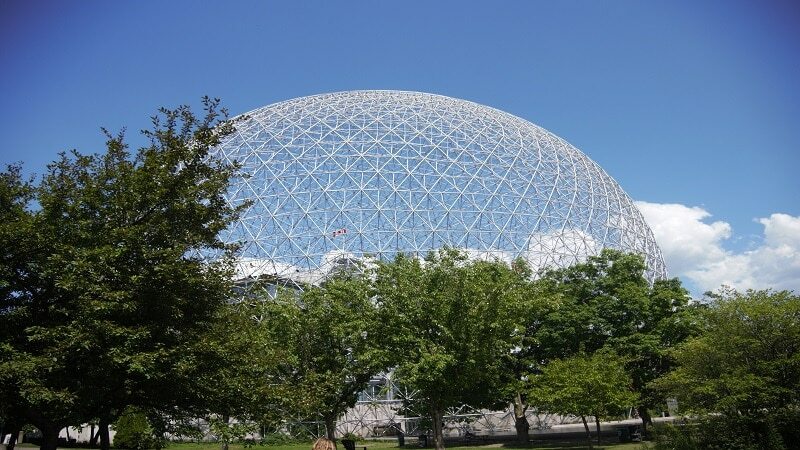 It was created by Richard Buckminster Fuller, another American artist who died 34 years ago and was also an engineer and an architect. 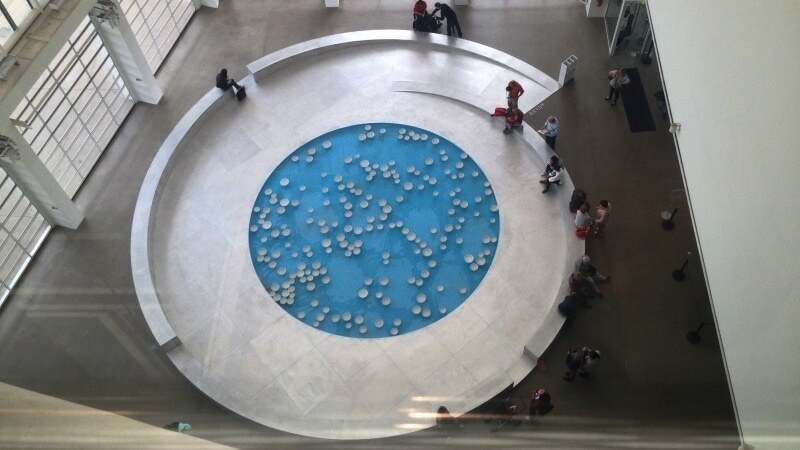 The dome will host the famous installation of the French artist Céleste Boursier-Mougenot : a very blue swimming pool with white china bowls floating on it’s surface. Influenced by a slight current, they run into one another producing a melody similar to that generated by Tibetan bowls. Very soothing and submersive. Ticket for both Museum of Contemporary Art and La Sucrière : 16/9 euros. Museum of Contemporary Art – 81, quai Charles de Gaulle Lyon 6 – Closed on Mondays. La Sucrière. 49-50, quai Rambaud Lyon 2 – Closed on Mondays. « Radome ». Place Antonin Poncet Lyon 2 – Open every days. Free entrance. ultricies Lorem ante. id nunc consequat.